We start our pilgrimage in the footsteps of St. Paul as we board our plane and depart for Greece. Meals and beverages served in flight. Upon arrival in Athens we are met by our friendly PATHFINDERS guide who escorts us to our motor coach. After checking into our hotel enjoy the remainder of the day to relax or take a stroll along the streets of Athens. This evening our group will gather for a welcome dinner. Overnight in Athens. Today our journey takes us through Athens where we visit the Acropolis and Mars Hill where St. Paul talked to the Judges. Along the route, we see Constitution Square (Syntagma), the House of Parliament, the memorial to the Unknown Soldier, the University, the Academy and the National Library. Continuing down to Herodes Atticus street, we see the Evzones in their picturesque uniforms and the Presidential Palace. We tour the Panathenaic Stadium (where the first Olympic Games of the modern era were held in 1896), the Temple of Olympia Zeus and Hadrian’s Arch before reaching Acropolis. 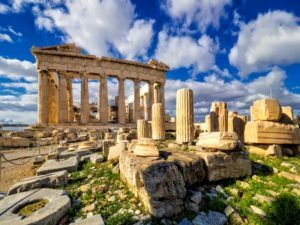 Here we visit the architectural masterpieces of the Golden Age of Athens: The Propylee, the Temple of Athena Nike, the Erechtheion and finally the Parthenon – the monument that “puts order in the mind” and “is harmony between material and spirit” Beneath the Acropolis is the Areopagus or Mars Hill. This is where St. Paul made his famous “Men of Athens” speech revealing a considerable knowledge of the Greek philosophy and character. Dinner and overnight in Athens. We begin today by following closely the same route Paul took during his journey to Corinth. After a short stop at the Corinth Canal, which connects the Aegean and Ionian Seas, we arrive in Ancient Corinth. 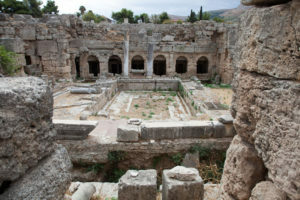 We see the ruins of Corinth, where St. Paul worked with Aquila and Priscilla and walk through the first century shops, the Agora, Temple of Apollo and the Bema Seat. We return to Athens for dinner and overnight. 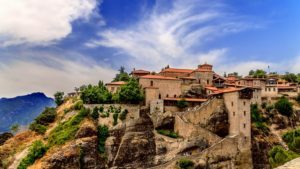 Today we continue our journey as we drive to spectacular Meteora. We visit the famous Cenobitic Monasteries that are perched precariously on top of huge and precipitous columns of rock that rise up out of the ground, thereby giving rise to the name “Meteora,” which means “in the air.” It was in the 11th century that the first hermits sought refuge in the caves of Meteora, where the solitude and spectacular vistas enhanced the mystic way of life. Eventually the hermits began to group together in monasteries decorating them with frescoes and icons by the great artists of the day. Dinner and overnight Meteora. Following breakfast we travel to Berea where Paul established a small church. We view the reconstructed steps of the bema (or rostrum) and see the newly placed mosaics of Paul and the plaque of scripture regarding the “more noble” church. We then visit the Jewish Quarter before heading on to Thessaloniki for dinner and overnight. Today we drive to Philippi, where St. Paul delivered his first sermon in Europe, sowing the seeds of Christianity. It is here that St. Paul baptized a certain woman named Lydia, the first Christian convert in Europe. We visit the Roman forum and the prison where St. Paul and Silas were thrown. 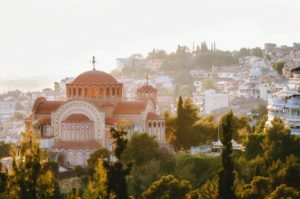 We continue into the modern port city of Kavala, ancient Neapolis, where St. Paul, accompanied by Silas, Luke and Timothy, first set foot in Europe. This ancient city was later renamed Christoupolis because it was the first European city to accept Christianity. We return to Thessaloniki for dinner and overnight. Today we explore Thessaloniki, the Roman Market, theater and baths. Our teaching today takes place at the theater of Agora,where Paul visited often. 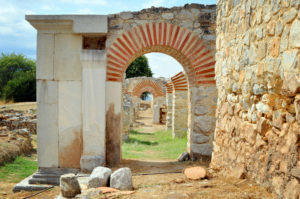 We make our way to the Arch of Galerius, the City walls, Chain Tower and Citadel. We make our way to the white tower, Byzantine churches, the cave and well of the Apostle Paul and Monastery of Vlattadon. We then take some time to gather right at the stairs of the walls overlooking Thessaloniki. We then continue to Jason’s home, Aristotle’s Square and statue of Alexander the Great. After some time at leisure we gather for our farewell dinner. Overnight in Thessaloniki.